A song to play while reading about the Athletics: “A Theme for Oakland,” by the Phenomenauts. For 30 years, the Oakland Athletics had used Kool and the Gang’s “Celebration” as their victory song. That’s fine and all, but a bit cliché, no? 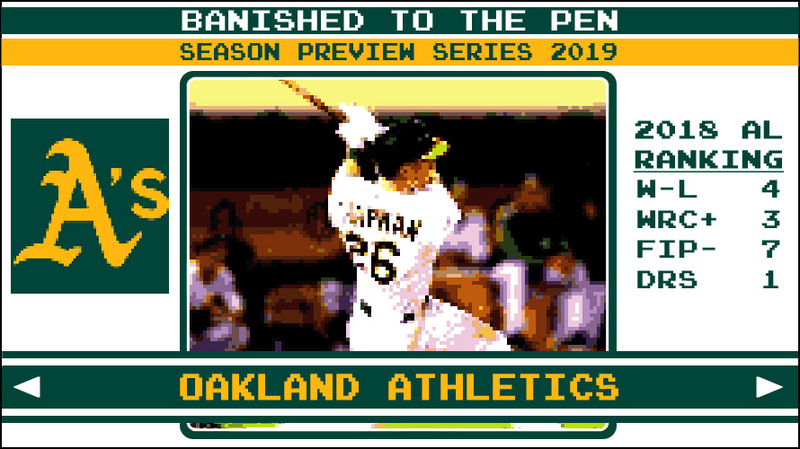 In 2015, the team unveiled a new one: “A Theme for Oakland.” It’s actually really good, and hopefully will be played with some regularity this season. The band also apparently snuck onto the Warped Tour one year. So two thumbs up here. Traded to the A’s by the Astros for some guy named Brandon Bailey (He’s 23 and repeating High-A), Laureano has put up a nifty .271/.355/.445 line in five minor league seasons, and looked very comfortable in AAA in 2018, to the tune of a .297/.380/.524 and 136 wRC+. His success continued in a small sample in the big leagues, hitting .288/.358/.474 in 178 AB, good for a 129 wRC+. That’s all well and good, and encouraging, but if you go behind the numbers, you find even more to like about Laureano. Going back to the nifty catch and throw mentioned earlier, Statcast has Laureano covering 76 feet of outfield grass, at a sprint speed of 29.1 feet per second, then collecting himself and throwing a near-perfect strike all the way to first base at 91.2 mph. The ball travels 321 feet in the air, so it looks like a bit of a rainbow, but you don’t generally have rainbow throws traveling in excess of 90 mph. Now to his sprint speed: 29.1 feet per second is right around his season average sprint speed, and it puts him in some impressive company. Whit Merrifield, Mike Trout, and Dee Gordon are all within .1 ft/sec, and Statcast puts Laureano in the 92nd percentile in terms of sprint speed. So he’s good and fast. Then there’s the bat. Now, this is a small sample, just 178 AB, but Statcast figures Laureano got the bat on the barrel in 11.1% of his plate appearances. That’s just a tick behind league leader Joey Gallo (11.4%), and just a tick ahead of both Mookie Betts and J.D. Martinez. That’s some good company, and on top of that, Laureano’s average exit velocity was 89.8 mph, which put him just ahead by that metric of Nolan Arenado and Cody Bellinger, and just behind Anthony Rizzo. What I’m saying is there’s something to dream on here. With that in mind, how do things look for 2019? Laureano received a fairly optimistic power projection from the normally conservative ZiPS projection system, which sees him clubbing 15 homers in just over 500 at bats. A roughly league average 98 projected OPS+, combined with top-shelf defense could yield substantial value from a young, cost-controlled centerfielder. Even a slight regression in performance would provide excellent value at a premium defensive position, considering Laureano put up 2.1 WAR last year in just 48 games. Also, Laureano showed consistent pop in nearly all his stops in the minors, so there’s some reason to believe the power is real. He also showed relatively good plate discipline, and there’s the outside chance he could grow into more power as he matures and/or ramps up his contact rate. There’s plenty to dream on with Laureano, and I wager a lot of A’s fans are doing just that. What is the A’s most recent accomplishment? The 2018 Oakland A’s finished the season with an improbable and almost universally unpredicted 97 wins, good for a shocking second place finish in the American League West and an appearance in the AL Wild Card game. How do the A’s define success in 2019? When the A’s won 97 games in 2018, they beat an uninspiring PECOTA projection of just 77 wins. This unexpected and remarkable feat was pulled off by a collection of unheralded prospects outperforming expectations, cast-aside veterans returning to form, and the sorcery that was Khris Davis‘ fourth consecutive season hitting .247. Stripped of only an aging Jed Lowrie through free agency, and a resurgent Jeurys Familia via trade, the team retains most of last year’s starters, and the entirety of its young core. Building on a 97 win season seems unlikely, but again besting a pessimistic PECOTA projection would be a good indicator of success. With little doubt, the player most in line with statistical oddities that attract attention and adoration in the Effectively Wild community is Khris Davis, less for his prodigious power than for his uncanny and perhaps otherworldly ability to hit not less and not more than .247, along with an inexplicable inability to properly throw a baseball. Davis is a shining beacon of weirdness and wonder, who also consistently provides value with his one true tool. On the day of Jesus Luzardo‘s debut start, everyone in the stands receives a rubber lizard wearing a small jersey bearing the number zero. (Lizard-0. Eh?) I know, it’s a stretch, but, hell, it’s Oakland. All fans also receive a complimentary hot dog sandwich.